Rubber Stamp Pad No 2 size, 3-1/4 x 6 inch for Handle Rubber Stamps. Has a heavy duty felt pad covering for durable use. These pads are not like pads you would buy at Wal-Mart®. They are made for extra stamping service, giving thousands of impressions and are totally re inkable with Ideal Stamp Ink. These No. 2 Rubber Stamp Pads are rugged, long lasting and available in three different colors (Black, Red or Blue) or Dry with no ink in the pad for adding your own special ink. Each no. 2 rubber stamp pad is protected by an air-tight cellophane wrap to assure freshness. 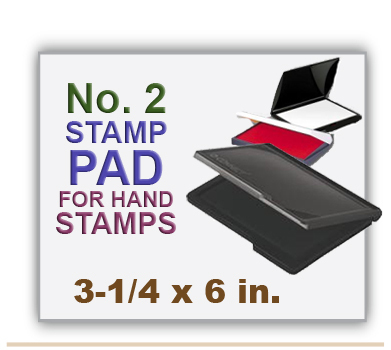 Order your heavy duty Rubber Stamp Pad here today.